As Lead Adventurer here at Nerve Rush HQ, I recently took off for a week to experience adventure in Jordan as part of a partnership with the Jordan Tourism Board. 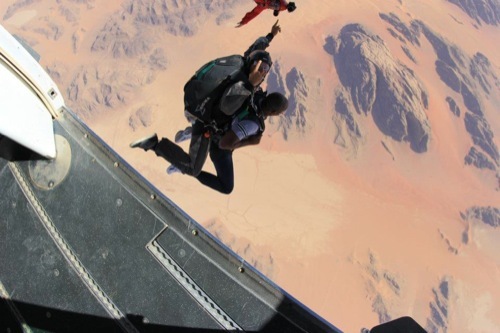 One of these incredible adventures was skydiving over Wadi Rum (the valley of the moon). While practically extraterrestial, we’re still debating internally whether we can include this on our top 7 places to skydive on each continent (does the moon count as a continent?). Anyways, between finishing my jump on the moon (which, by the way, is every bit awesome as it sounds) I sat down with Marwan Atalla, director at Skydive Jordan to find more about the details behind this unique adventure. 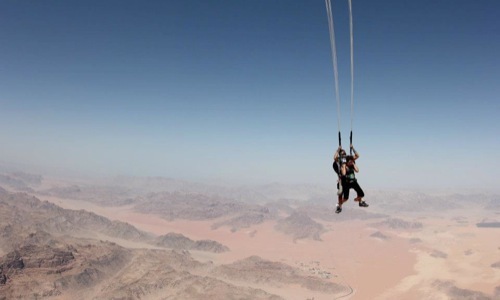 Marwan, what can you tell us about Skydive Jordan, one of the most unique adventures in the Middle East? The Royal Aero Sports Club of Jordan (RASCJ) was established with the purpose of promoting aero sports, and enhancing the tourists’ experience in Jordan. To date, RASCJ has offered Hot Air Balloon Rides, Micro-Light flights and Ultra-Light flights. The idea of introducing Skydiving has been under consideration for 3 years, but we wanted to do it safely, and professionally. We did our research and determined that Skydive Dubai had become one of the world renown skydiving facilities in the world. We approached them, and quickly found out that they were willing and enthusiastic partners. We signed a partnering agreement for offer skydiving in Jordan for a three week period during the summer if 2012. This would be a good way to test the location and the demand. Needless to say, everything exceeded our expectations, and Skydive Jordan 2012 was a huge success. What makes Wadi Rum such a great jump zone location? 2. Location and proximity to Aqaba (only 40 minutes away). 3. The availability of a natural flat area for the skydiving operation. 4. The majestic view all the way from the ground, to 15,000 feet, and back down really makes you look like you’re skydiving on the moon. I speak from firsthand experience – you treat your customers ridiculously well, from signing up to the waiting room and jumping. What is your secret? One of our goals is to enhance tourism. Tourism is all about service, and the experience of the tourist is a crucial part of his/her trip. Our goal is to create positive, lasting memories for anyone visiting the south of Jordan and hope that this one-of-a-kind skydive experience can add to their overall experience in the country. Is skydiving new to Jordan? 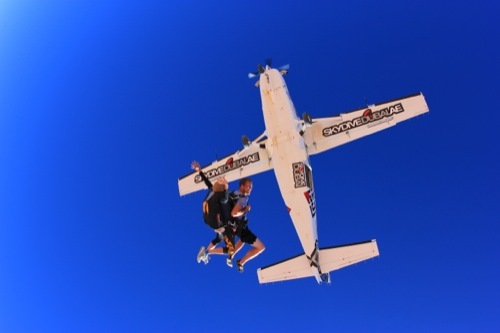 Could you talk about your partnership with Skydive Dubai? Jordan did have a very small skydiving operation, but it was located in an international airport, with a very small aircraft – so it was not sustainable. In order to move to a more sustainable model we entered into a partnership with Skydive Dubai which allowed us to tap into a pool of professionals with hundreds of thousands of hours of combined experience, as well as the latest equipment, aircraft and safety systems. We operate the skydive operation now as a partnership. Could you walk through what it costs to Skydive Jordan? What kind of packages and jumps does Skydive Jordan offer? The backbone of our revenue is the Tandem operation, in which a customer jumps with a licensed tandem master. We charge JD 190 per jump and jumpers get videos and photo stills included in that price. The price is below market in the Middle East and Europe thanks to the sponsorship of Skydive Dubai. Licensed sports jumper pay JD25 per jump. Nerve Rush note: The current conversion rate is close to JD1 = $1.4US. To get US costs, simply multiply those costs by 1.4x. Any future plans? What other adventures do you guys have up your sleeve? We plan to do Skydiving again in summer 2013. We are also looking into parasailing and gyrocopters. Safety is our number one concern, so we deliberately take our time and study all aspects of any new aero sport before introducing it. We also have to coordinate with the Civil Aviation Regulatory Commission of Jordan, which oversees our operations. Thanks Marwan for sharing the gut-wrenching adventure of Wadi Rum with us first-hand. We’ll definitely be coming back! If you’re searching for Middle East adventure, check out Skydive Jordan.